Last night we drove by the mega-crowd gathered for Ultra Music Fest downtown as we were on our way to see the Joffrey Ballet at the Arsht Center. The traffic was maddening and there were no parking spaces anywhere so we parked in the lot of a restaurant where we had planned on having dinner after the ballet. The Joffrey's performance was enjoyable, some pieces more so than others, some dated, some fresh, but all in all it was an entertaining evening. This year Winter Music Conference came and went so quickly that I was only able to attend a couple events. Tonight there was a closing party at the Penguin Store on Lincoln Road with diva Elaine Lancaster spinning in the window. As if that wasn't enough, the Bravo Channel arrived with a full camera crew to film for Miami Housewives. Lea Black and her assistant Jason Clarke were being filmed as if they were visiting the shop to see Elaine and do a little shopping. While they were at the store, Dennis Rodman just happens to show up. This being reality television, nothing was spontaneous and it was all planned. Hey, I didn't mind. I took photos, munched on extra-rich cupcakes and got a free hat courtesy of Penguin. 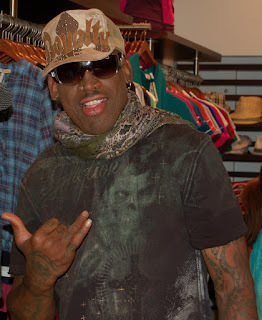 When the shoot was over the crowd that had been waiting outside taking photos of Dennis swarmed into the shop hoping to get a shot with Mr. Rodman himself. No one cared about the reality show, they wanted a photo with Mr. ex-Basketball Star. Next we strolled down Lincoln Road (Dennis, his assistant, Elaine, Joey Mugica, Cecilia Paz and I) for a quick stop into Score where Macy Gray was doing a sound check for her performance tonight. Lincoln Road was a mob scene and everyone was looking (or trying to get a photo or say hello) at Elaine and Denise walking arm in arm. Just another one of those nights in South Beach. Photos: Elaine Lancaster DJing in the window of the Penguin Store. Dennis Rodman in the Penguin Store. Photos by James Cubby. Great seeing you Cubby darlin' & the photo's are smashingly divine.....love you, Elaine.